In the past, when my son was a little boy, I often helped him with building his own Lego sets and sometimes we also built cranes together. He left the house for marriage, taking his Lego with him, which is now collecting dust in his attic and waiting for his renewed interest. Building cranes now became my ambition. With my still very limited Lego collection, which had grown some with the purchase of a 9V motor, I made this first level luffing crane. Only the luffing motion is motorized. Next one was a bit larger, total height appr. 0,5 m, but, still having only 1 motor, only luffing is powered. This model is supposed to look like an existing shipyard crane, working on a ship repair yard in Vlissingen, The Netherlands, the same yard I’m working on. I tried some solutions for connecting the beams used for the legs under different angles. These worked well for this relatively small and light model. The idea of building this crane on a larger scale developed into a solid plan. 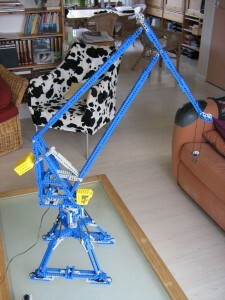 As the real crane is painted mainly blue, I decided to use the same colour in Lego. The decision to use blue, was not very clever cost-wise ( blue material is quite rare and this is reflected by prices).